Dharamsala News, Updates on Tourism News, Culture News, Environment News,Sports and Travel News in Dharamshala..Dharamsala !! Breaking News for Dharamsala India...Click Here !! "Among the Immovables, Iam the HIMALAYAS! "..Bhagavad GITA. Electricity conservation scheme has been put into practice by Himachal Pradesh Govt. We can look forward to some great cricket entertainment in October, 2008 in Dharamsala Cricket Stadium in the Himalayas, by a warm up game between India and Australia cricket teams. We hope, that both IPL and ICL shall together with the entertainment, also have much success in promoting the Game Of Cricket..A Human Spirit and developing new talents in this Sports Industry for new geneartions to come. With the coming season we can look forward to better air connectivity to Kullu/Manali/Dharamsala/Shimla with more regular flights. Dharamsala News.. April 15,..Celebrating 'Himachal Day' 2008. The Himalayan state of Himachal Pradesh surrounded by the majestic Dhauladhar Range, celebrates 'Himachal Day' and salutes the spirit of the Mountain Folks who are today a part of building this Green State as the Highest Literate State of India.
" The difference between what we do and what we are capable of doing would suffice to solve most of the world's problems." 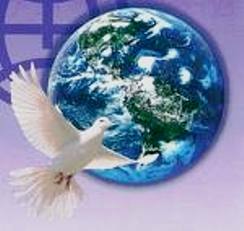 World Peace Prayers, 2008 !!
" 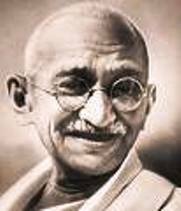 Nonviolence is the greatest force at the disposal of mankind. It is mightier than the mightiest weapon of destruction devised by the ingenuity of man !" Inner Peace, is the first step towards, World Peace !! 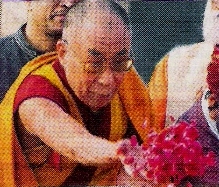 His Holiness The Dalai Lama of Tibet in Rajghat..pays tribute to the Father of Non-Violence..Mahatma Gandhi, March 29, 2008 ! His Holiness, the Dalai Lama and HH Karmapa of Tibet attending the 'World Prayer Day' for Non-Violence and Peace in the World..in Dharamsala, Himachal Pradesh, INDIA , 07th April, 2008. 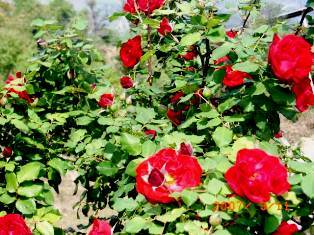 Dharamsala News,Red Rose Rush at Vidya Niwas, Dharamshala ! With the approaching 'Baisakhi Festival', the popular festival of the Northern plains & hills..Guests at 'Vidya Niwas', Dharamsala can now catch-up on the early morning news at the 'Sunrise Porch', in the august company of a bevvy of Red Roses spreading their radiance and sweet fragnance all around the Himalayan Home !! You can enjoy the variant colors of the rainbow in orange, yellow, pink, white and peach rose blooms. The Himalayan Valley is resounding with the Vedic Bhajans (Holy Hyms) and 'Bhandaras' (Community Feast- 'Dhaam') on the auspicious occasion of 'Ram Navmi'! With the on coming monsoon season the hill folks of Kangra Valley pray to Indra-Nag the Holy Serpent King of 'Indra' - The Rain God. With the harvest season on in the northern plains and hills the India Himalayas are celebrating today the famous 'Baisakhi Harvest Festival'...Feasting,Holy baths in Holy rivers and traditional ceremonies at home and visits to Holy shrines for Thanksgiving is a colorful feature to experience..TODAY !! 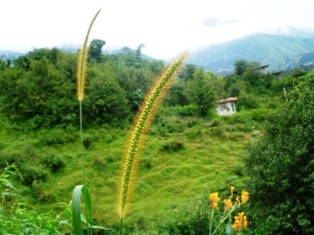 The Annual 'Suhi Spring Fair' in Chamba Valley of Honey & Dale has begun from today till 12th April, 2008. 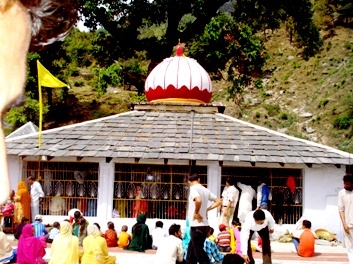 It is celebrated with fun and frolic at the hilltop Ancient temple of Suhi Mata. This fair is legendary for the famous Royal sacrifice made by the Rani of Chamba state, Queen Rani 'Sunayana'. She gave up her life in order to bring water to her loving Chamba Valley which was in a famine state in her time. 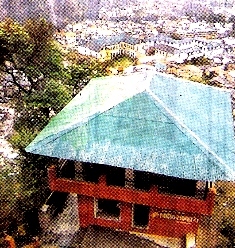 The palanquin-shaped temple today stands on top of a hillock above Chamba town is witness to this rare saga of that ancient period. Till now this annual fair is celebrated in her fond memories by the people of this wonderful green valley. This temple was erected by the Maharaja Sahila Varma for his wife's memory. This cultural heritage is conserved and practised even today! The World Health Day was celebrated by Corporate giant TATA Teleservices by organising Medical camps..Free Health and Treatment Day for the people of Shimla..the capital of Himachal Pradesh. Medical experts from all over the country gave free diagnosis and medicines to the poor and needy. On the concluding day of the six day Yoga Camp in Bilaspur the International famous YOGA Guru..Swami Randev gave Yoga lessons to the school kids...a Patanjali Yoga drive in the Himalayas ! The streets of Dharamsala was flooded with the Local Volunteers, School Kids, Tibetan Refugees, Migrant Communities, NGOs all in harmony and peace to participate in the "Annual Spring 'CLEAN DHARAMSALA " ECO- Drive, 2008. The auspicious Hindu 'Vikrami Samvat 2065' (The Hindu New Year) was celebrated throughout the Himalayan State of Himachal Pradesh with Fire Pujas (Havans), Yoga Retreats,'Bhajans'(Singing of Sacred Vedic Mantras & Hyms) and pilgrimages to various Holy 'Shakti' Hindu sites. 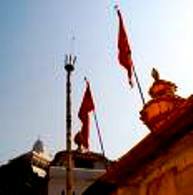 The Annual Spring NAVRATRA Puja at all the Temples of Shakti Matas..the Jawalamukhi Temple, Chintpurni Temple, Chamunda Temple and the Brajeshwari Temple in Dharamsala, Kangra starts from today with devotional vedic mantras and 'bhajans'(Hymns) dedicated to the Goddess 'Shakti'. Millions of pilgrims from all walks of life all over the country pay their homage for a good season and year ahead for their family and business. The Himalayan farmers pray to the Goddess for a good harvest season. Free community meals (Bhandaras) are served for nine days of this auspicious 'PUJA' in the Himalayas ! 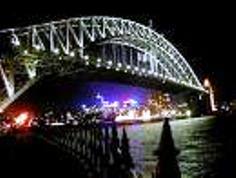 Lights OFF..'Earth Hour Campaign' for Global Warming, 2008 from Sydney Harbour, Australia, March 30, 2008 ! The Annual Spring Fair of Khanyara Village was inaugurated by Transport Minister, Sh. K Kapoor was a big success. The event was more colorful..with wrestling matches, cultural and folk artists program along with the beats of local drums..'Tamak' welcoming people from all walks of life! The State Govt. 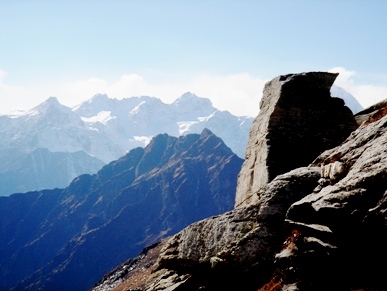 of the Himalayan State of Himachal Pradesh will soon prepare the 'Tourism Master-Plan' for the state for promoting the mountain region with main eco-drive and infrastructures on public-private participation keeping in mind safe ecological safeguards of the mountains. Main emphasis will be given to school kids green tours for them explore and discover, what they read in their school books and 'backpacker' experience ! The famous 'Bhuri Singh Museum' of Chamba valley will celebrate its hundred years with Himalayan culture seminars and exhibition. It was created by the passion and vision of Maharaja Bhuri Singh ( 1904-1919) the ruler of the erstwhile Chamba State near Dharamsala. Various ancient arts & artifacts are in display at the Museum including the famous ' Chamba Rumal'!! It was interesting to attend and hear senior academicians on 'Responsible Tourism' in India starting from the foothills of the Himalayas organised by PATA Chapter. The Government of Himachal Pradesh, is keen on development of Watershed and Groundwater Management in the Himalayan state which includes rain water harvesting on a public-private basis with the support of National Bank for Agriculture and Rural Development in the next five years. A boost to International tourism with the coming up of a Modern Shopping Complex of 4000 shops and elaborate parking space in the Himalayan town of Dharamsala. The Himalayan state of Himachal Pradesh, on the occasion of 'World TB Day', initiated by the HP Government, is now starting a TB Culture Sensitivity Test at Dharampur TB Sanatorium Center in Solan district. A great boon to patients in the Himalayas. The Contemporary Himalayan Art exhibition at the Kangra Museum, famous for the Kangra Miniatures, in Dharamsala, has started from today for one week in which various local artists were encouraged and their talents were appreciated by the public and Department of Language & Culture. The celestial leap year of 2008, started with the auspicious Festival of Colors..HOLI , Good Friday, Id-ul-Milad and 'Navroza'( The Parsi New Year ). India, celebrated 'Holi' with harmony..blessings, and respect for each other. Vibrant Colors splashed the Indian skies in various forms of celebrations throughout 'Bharat Desh' !! A week long state level, the historical and cultural 'Nalwari'fair, was inaugurated at Luhanu Maidan in Bilaspur disrict of Himachal Pradesh by the State Government. 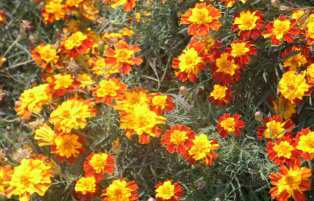 As Kangra Valley approaches the colorful Festival of 'HOLI'(20/21st March, 2008), Dharamsala today is vibrant with the colors of the Himalayan spring flowers across the mountain. Dharamsala News,Vibrant Colors of the Tragopan...March 16, 2008,Dharamshala Green News! The beautiful vibrant Western Tragopan (Tragopan melanocephalus) is one of the endangered species of the Western Himalayas. 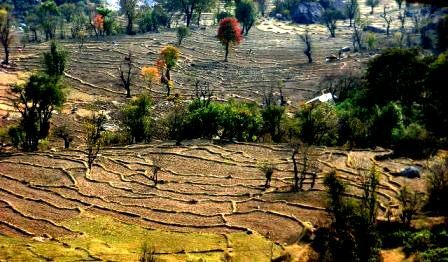 In the Himalayan state of Himachal Pradesh, it is found in the Bharmour and Pangi Valley in Chamba district near Dharamsala. Due to its rare presence the naturalists are keen to conserve the specie by making breeding centers in these Valleys with the help of the State Government. Dharamshala News,Dance Academy News...March 15, 2008,Dharamshala Green News! Famous Cine Star and Veteran exponent of 'Bharatnatayam' Indian Dance form, Ms. Hema Malini, has expressed a desire to open a Dance Academy in the Himalayan state of Himachal Pradesh to conserve this great cultural tradition and teach the young generation of the mountains. As children we used to collect the sticky grass blades in spring..make tiny baskets and fill them up with spring blooms! A fresh spell of snow in the higher remote regions of Dhauladhar Ranges in Kangra Valley..Bharmour & Pangi Valley in Chamba..Rohtang Pass in Lahual/Spiti Valleys and Kalpa in Kinnaur Valley dipped the temperature..experiencing the return of the chill in the Himalayan State of Himachal Pradesh. 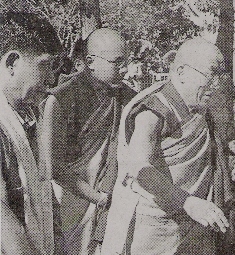 For more Update on Dalai Lama Dharma News..Click Here !